Peru is a fascinating place, and no trip through South America would be complete without the ancient Inca city of Machu Picchu. Fortunately, there are discounts that make tickets available to the Wonder of the World. University students, for example, enjoy almost 50% discount on the normal price of the ticket. How to buy Machu Picchu tickets for students? How much does the Machu Picchu entrance cost for students? 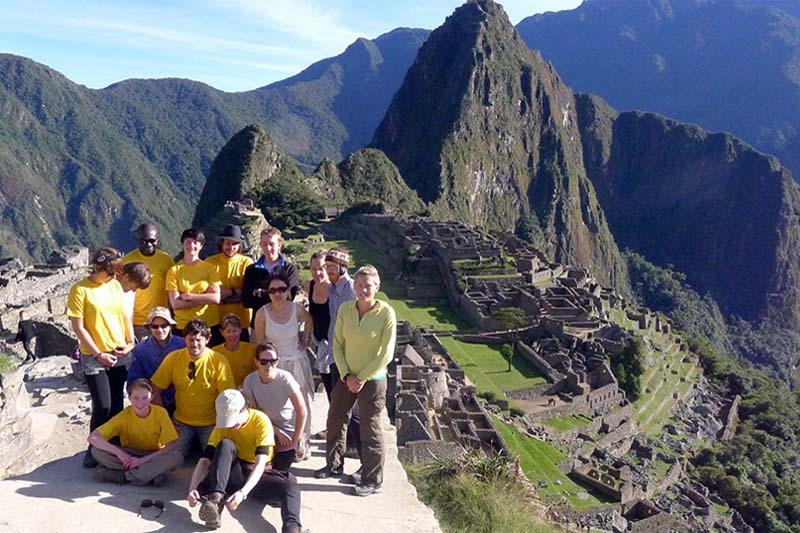 Is the ISIC student card valid for the purchase of the Machu Picchu ticket? I can not buy the Machu Picchu tickets for students! There are 2 ways to get tickets to Machu Picchu for students. The first is acquiring a ticket in person in the city of Cusco. The other way is to book it in advance online. Today, most students acquire their entry ticket online. Why do they prefer to do it that way? Well, because they manage to get a ticket with time in advance. If they do not, they run the risk of arriving in Cusco and not finding tickets available. To make the reservation online you need 2 documents: In addition to the university card, you need a copy of your passport (or identity document). The passport is used to reserve the ticket and the university card, to obtain the student discount. Ticketmachupicchu.com is the fastest and easiest platform to obtain Machu Picchu tickets for students. You only need to send us the scanned copy or a (clear) photograph of your university card. There are 4 types of tickets to Machu Picchu. Each of them offers a different experience in the Wonder of the World. The prices depend on the type of ticket that is chosen. University students 77 S/. 125 S/. 125 S/. 88 S/. CAN university students 32 S/. 80 S/. 80 S/. 43 S/. * The Andean Community of Nations (CAN) is composed of citizens of Peru, Colombia, Ecuador and Bolivia. The prices shown are in Peruvian soles. To make the reservation of the entrance to Machu Picchu you must enter our website. The sending of requested documents is info@boletomachupicchu.com. Choose ‘very well’ what days you want to be in Machu Picchu and the type of ticket. Check the tickets available for those days. Book Machu Picchu tickets by filling out the reservation form. Send the scanned copy of your university card along with a copy of your passport or identity document. Pay for Machu Picchu tickets through our multiple forms of payment. Print the tickets. While they are electronic tickets, you will need the printed Machu Picchu ticket. For students of universities or institutes of the same rank of all nationalities you need a copy of your valid university card, in addition to your passport or National Identity Document (DNI) as appropriate. For students aged 8 to 17 a copy of their passport or identity document is required. Children under 8 years old do not pay but need their passport or identity document to enter Machu Picchu. The university card is the necessary document to reserve an entrance to Machu Picchu. This document must be valid at the moment of entering the Wonder of the World. Own the name of the university. Possess the student’s readable names and surnames. Have the expiration date still valid at the time of entering Machu Picchu. The documents of registration, certificate of studies, master’s degree, doctorate or post-graduation are not accepted to access the Machu Picchu ticket discount. Be a undergraduate university student (or university-level institute). Be less than 25 years old. Own the university card valid at the time of entering Machu Picchu. Possess a valid identity document or passport. If the visitor meets the requirements, you only need to make your reservation online. In the case of students belonging to the Andean Community of Nations (Peru, Colombia, Ecuador or Bolivia); they access an even higher discount. 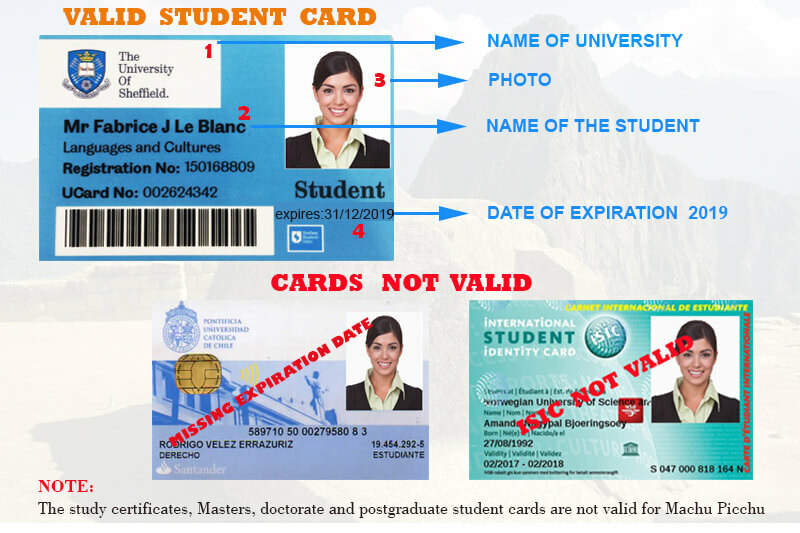 A few years ago, the International Student Identity Card (ISIC) was valid to acquire the Machu Picchu entrance with a student discount. However, currently this document is no longer valid to make the purchase (online or in person). The valid university card issued by your university is the only valid document to buy the ticket. Also, no other type of document is accepted as proof of registration, library card, etc. The official ticketing website does not work! Quiet. It is normal that the official Machu Picchu ticketing website does not work. Keep patience and keep trying until the problem has been resolved automatically. The official website only accepts ‘Verified by Visa’ cards as a method of payment! Yes. The official website of the Ministry of Culture of Peru only accepts ‘Verified by Visa’ cards as a method of payment. If you do not have this type of card, request it with your bank or make the purchase through another agency online. Paying the Machu Picchu ticket with Visa is easy. Each type of ticket has a ticket limit. A recurrent problem is the absence of tickets available for the Machu Picchu + Huayna Picchu entrance. This ticket must be reserved 3 months in advance. The others, with 2 or 3 weeks in advance. I am a university student but I can not reserve my tickets for students! Not all university students can access the discount. Students must be undergraduate, have less than 25 years old at the time of the visit to Machu Picchu and have the current university card. I can not book my tickets for next year! To book a Machu Picchu ticket with or without a discount for next year, you must wait until mid-December. Only during this part of the year, ticket sales are enabled. In ticketmachupicchu.com you can secure your ticket for next year from before. With us you assure your entrance to the Wonder of the World. Machu Picchu tickets must be reserved at least one month in advance. This will give you enough time to reserve everything else, such as: train tickets, guides, hotels and other tours in Cusco and Peru. The ascent to the Huayna Picchu mountain (with the ticket Machu Picchu + Huayna Picchu) is one of the most amazing experiences in Machu Picchu and must be booked at least 3 months before. The university students benefit with the almost 50% discount on the price of the tourist ticket of Cusco. This ticket includes the entrance to the main archaeological sites of Cusco and the Sacred Valley (Sacsayhuaman, Coricancha, Pisac, Ollantaytambo, etc). University students have a discount of $ 20 on average when booking their entrance to the Inca Trail with a university card. This amazing trekking route of 4 days and 3 nights leads to Machu Picchu directly. The Inca Jungle is a tour that takes Machu Picchu in 4 days and 3 nights doing adventure sports along the way. College students also access a special discount. As well as the Inca Jungle, many other tours in Cusco have a student discount.